Removing a tree from your yard, unit complex or rental property in Holland Park? 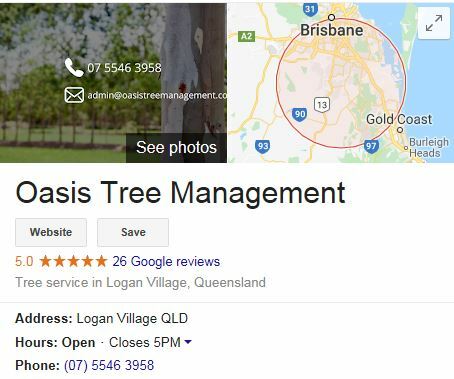 If you have a tree that is causing you problems and you are located in Holland Park, talk to a Brisbane Southside tree removal specialist about what your options are. Tree problems such as unmanageable debris/branches constantly falling on your property (Gum trees tend to do this a lot), blocking desired construction such as house extensions, pool installation or new fencing, or perhaps the simple problem that you are redesigning your garden and you want to make way to plant different trees that are easier to manage. Oasis Tree Management can assist you in your tree removal process. Simply phone us on 07 5546 3958 for an obligation free quote and advice! Would you rather prune and manage your trees than remove them? Tree pruning isn’t only effective for fruit trees and small shrubs. We can assist you in pruning your Gum trees, Jacaranda trees, Palm trees, Wattles and another other medium to large trees on your property. If your tree is overhanging your neighbours property and they have complained, let us come and give you an obligation free quote to trim the branches back to the fenceline.